Dimensions 0 by 6.10 by 9.06 in. Amazon.com description: Product Description: Either/Or (1843) ingeniously describes the turn in 19th century philosophy to the reification of human existence. Written in the form of a modern novel, the book shifts style and thinking in virtuoso fashion. Kierkegaard`s major early work provides a philosophical analysis of the living manifestations of aesthetics, ethics (and religion). This ""monster of a book"" is made accessible here based on the latest state of research. 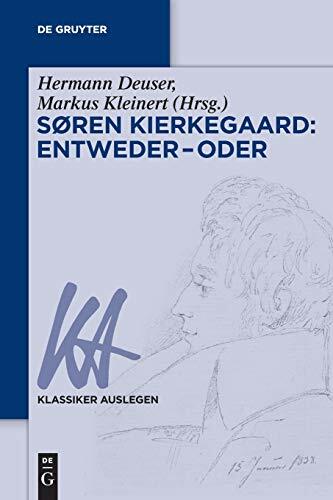 With Hermann Deuser (other contributor) | from Walter De Gruyter Inc (February 1, 2017); titled "SÃ¸ren Kierkegaard: Entweder â Oder"
About: Either/Or (1843) ingeniously describes the turn in 19th century philosophy to the reification of human existence.